Helping schools use limited resources effectively by allowing them to spend various categories of school funding on a broader range of expenses that still achieve the intended goals (HF 564). Expanding the ways Iowans can earn a high school equivalency diploma when they meet academic standards. New pathways include a test battery, credit-based measures, and attaining academic credentials of equivalent or greater rigor (HF 473). Limiting Iowans’ ability to get ahead with mid-year cuts of more than $26 million to education, community colleges and state universities (SF 130). Failing our schools with inadequate funding that doesn’t keep up with inflation, let alone make up for years of unmet needs. School superintendents say this will cause teacher layoffs and larger class sizes (SF 166). Creating greater equity among school districts with consistent per-pupil school funding (SF 455). Fixing the huge disparity in school transportation costs so that each student gets the same amount for their education once they arrive at the school doors (SF 455). Improving efficiencies by offering financial incentives for school districts to share administrative functions (HF 633). Clarifying that FFA programs qualify as Career Technical Education (CTE) programming (HF 648). Providing necessary help for students learning English (SF 427, HF 6). Providing necessary help to better ensure low-income pupils can succeed in school (HF 8). Including age-appropriate information on dating violence and prevention in human growth and development instruction (SF 119). Offering financial incentives to expand Iowa’s preschool offerings to meet needs (SF 136). Taking $200 million from public schools, and eliminating the Iowa Department of Education and Iowa Public Television (SF 29). Instituting a political party litmus test for university faculty (SF 288). Banning teachers and school leaders from voicing their opinion on education issues (HSB 47). Offering incentives for smaller communities to increase affordable housing for working families (SF 488). Increasing opportunities for local small businesses that make and sell Iowa beer, wine and distilled spirits (HF 607). Adding to the list of invasive plants that can quickly crowd out corn and soybean crops. Palmer Amaranth is an edible flowering plant that can no longer be imported, sold or distributed in Iowa (HF 410). Ensuring state-provided Apprenticeship Training funding goes to Iowa residents only (HF 231). Passing an anti-worker, anti-growth budget that significantly cuts Economic Development funding (SF 130, SF 513). Eliminating support for the Leopold Center for Sustainable Agriculture at Iowa State University, which jeopardizes a successful program that has encouraged entrepreneurship and small business development across the state (SF 510). Lowering wages and stepping on local communities by rolling back minimum wage increases already in force in four counties—Polk, Johnson, Linn and Wapello (HF295). Preventing local governments from setting better standards for minimum wage, hiring practices, leave, benefits, scheduling or other terms of employment (HF295). Interfering with efforts to ensure high-quality local construction by eliminating Project Labor Agreements and pre-qualification questionnaires on complex public improvement projects (SF 438). Driving down wages in rural areas by eliminating the requirement that prevailing wage rates be paid to laborers and mechanics on federal construction contracts (HF 203). Hurting Iowa jobs and businesses by removing the Buy American requirement that U.S. steel be used on federal construction projects (HF 203). Hurting 185,000 family budgets and the communities where they live and shop by prohibiting public employees from collectively negotiating terms of employment, including health insurance and safety (HF 291). Cutting protections for Iowans hurt on the job through no fault of their own, reducing an employer’s liability for injuries, and encouraging employers and insurance carriers to avoid paying claims (HF 518). Stimulating and diversifying economic and agricultural development by creating a marketing and production program for industrial hemp, which is a low-input, sustainable cash crop (SF 329). Saying “no” to tax relief for Iowa farmers, small businesses, teachers and families by refusing to couple state taxes code with federal changes (SF 428). Raising the minimum wage for hard-working Iowans (SF 156).. Preventing bad employers from stealing wages from their workers (SF 80). Ensuring equal pay for equal work (SF 340). Ensuring timely, appropriate help for kids with autism spectrum disorders (HF 653, HF 215). Limiting the harmful effects of congenital Cytomegalovirus (CMV), which can cause hearing or vision loss, lack of coordination, muscle weakness, cognitive impairment and seizures (SF 51). Reducing breast cancer deaths by requiring that mammography reports sent to patients include information on breast density if the patient has dense breast tissue (SF 250). Improving mental health and disability services in rural areas by allowing counties to equally share in regional funding (SF 504). The Republican-controlled House failed to approve an expanded, comprehensive medical cannabis program to properly treat more Iowans with debilitating conditions, and allowing medical cannabis to be grown, manufactured and dispensed in Iowa (SF 506). Cutting help for abused kids, the elderly, and sick, disabled and vulnerable Iowans by reducing access to quality health care, mental health care and other critical services at a time when the safety net for our most vulnerable is already in trouble (SF 130, HF 653). Cutting help for Iowans trying to give up smoking and other tobacco products by $1 million (HF 653). Cutting $8 million for Department of Human Services field operations. These are the people who protect children and seniors from abuse (HF 653). Increasing the cost to Iowa taxpayers with a new State Family Planning Program while reducing the number of Iowa health care providers (HF 653). Making it harder for Iowa parents to find out if their family qualifies for Medicaid and Hawk-I health insurance (HF 625). Increasing the likelihood of unintended pregnancies and abortions by shutting down a successful family planning program (HF 653). Making it more difficult for Iowans to get fair compensation when they’ve suffered at the hands of a negligent health care provider (SF 465). Making it extremely difficult for Iowans who are sick or dying from asbestos exposure to be adequately compensated for their pain and suffering (SF 376). Continuing Iowa’s Medicaid privatization mess that has dramatically increased costs to taxpayers, forced businesses to close and hurt the health care of thousands of vulnerable Iowans; and refusing to consider marginal improvements (SF 368). Expanding the criminal offense of “sexual exploitation by a school employee” to include full-time, part-time and substitute employees, as well as volunteers and contract employees (SF 238). Enhancing public safety by improving law enforcement and emergency communications systems (SF 500, HF 467). Making roads safer by requiring drivers to remove their vehicle from the traveled portion of the road if it was damaged in an accident, but is operable and can be reached safely (HF 313). Protecting kids by updating the definitions of “child in need of assistance” and “child abuse” to apply in additional cases with dangerous substances in the home, including cocaine, heroin and opioids (HF 543). Requiring temporary staffing agencies to do background checks on employees for nursing homes and assisted living centers (HF 576). Prohibiting government offices open to the public (including public libraries and schools) from using a monitoring device where a person expects privacy, such as in a toilet, bath, shower or locker room (SF 499). Jeopardizing the safety of Iowans, neighborhoods and communities by cutting services for victims, reducing access to the courts, delaying prosecution of crimes and making prisons even more dangerous (SF 130, SF 508, SF 509). Hurting kids with cuts to the Court Appointed Special Advocate program, which will no longer be available in all in all 99 counties (HF 640). Hurting elderly, disabled and vulnerable Iowans by cutting inspections of nursing homes (HF 640). Putting food safety at risk with cuts to the Iowa Department of Inspections & Appeals (HF 640). Reducing fatalities by updating Iowa law for safely passing bicyclists on our roads. Improving safety for all road users by requiring bicycles to use a rear light visible from 300 feet between dusk and dawn (SF 450). Helping fire fighters and other public safety organizations raise money for charity or local public safety efforts from passing motorists. “Filling the Boot” is not legal in every Iowa community (SF 163). Helping victims with crime-related expenses that may arise years later and ensuring family members are compensated for lost wages when attending court proceedings (SF 276). Protecting students from worsening a concussion injury and requiring school coaches to be certified in CPR (HF 563). Protecting the health of students and educators by requiring radon testing in public schools (HF 7). Requiring that human growth and development instruction include age-appropriate information on dating violence and prevention (SF 119). Implementing health and safety checks for homeschooled students, in light of instances of child abuse and child death (SF 138). Establishing training requirements, procedures and prohibitions on physical restraint and seclusion of students by school districts and accredited nonpublic schools (SF 204). Training school personnel on suicide awareness, suicide prevention and on crisis plans (SF 378). Protecting all students by strengthening anti-bullying policies and programs (SF 390). Ending licensing for such occupations as social work, mental health counselors and respiratory therapists (HSB 138). Keeping traffic moving efficiently by updating traffic laws for turns on red. On a red light, a driver may turn right from all lanes designated for right turns, or left from all lanes designated for left turns on a one-way street (HF 372). Failing to pass any legislation to seriously address the state’s water quality problem. Scaling back nuisance protections for local residents in the vicinity of animal feeding operations (SF 447). Cutting funding for state parks to such an extent that some will likely be closed (SF 510). Cutting the Resource Enhancement and Protection program (REAP), which supports cities and counties that want to enhance quality of life through urban conservation and by developing natural, cultural and historic resources (SF 510). Emptying the Cultural Trust Fund account, which provided grants to arts and cultural organizations throughout Iowa (SF 130). Using resources efficiently by giving county auditors the flexibility to combine staff and polling locations when low voter turnout is expected in primary and general elections (HF 471). Protecting the rights of Iowans by setting higher standards for law enforcement to seize property— especially money and cars—that may be related to a crime (SF 446). Saving taxpayer dollars by ensuring private parties cover more of the costs of civil services they require from county sheriffs, such as bills of sale and deeds for land sold (SF 501). Ensuring indigent Iowans obtain legal counsel when they’re charged with a crime that carries the possibility of jail or prison time (SF 374). Eliminating the Watershed Improvement Funding Program, which encourages cooperative projects within watersheds (SF 510). Delaying access to justice and necessary services with cuts that require further scaling back clerk of court hours and specialty courts (SF 508, SF 509). Preventing local governments from voluntarily entering into agreements with local contractors that ensure good-paying jobs, quality work and cost-effective projects (SF 438). Weakening the rights of thousands of Iowans by making it more difficult for them to vote in elections, including elderly and disabled Iowans, college students and others (HF 516). Creating a costly registration card program for voting (HF 516). Establishing a better way for Iowans to identify themselves at the polls by allowing them to present common forms of ID (Amendment on floor). Jeopardizing the drinking water of nearly a million Iowans, raising water bills and robbing local taxpayers of a major asset by dismantling Des Moines Water Works (SF 456/HF 484). Ending retirement security for public employees, including teachers, fire fighters, and police officers ( SF 45). Discouraging Iowans from filing legitimate lawsuits by placing a financial burden on plaintiffs, even before the case is heard by a judge or jury (SF 71). 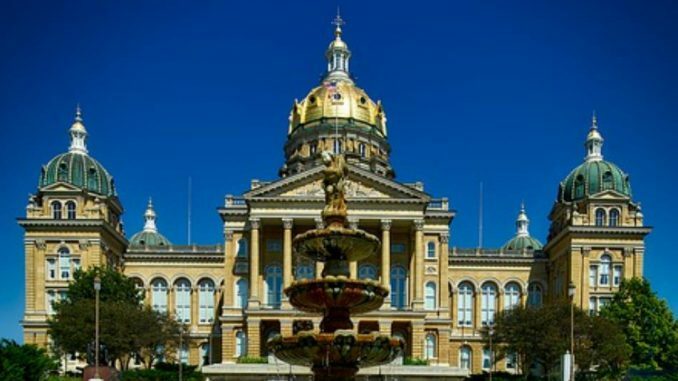 Decreasing funding for National Guard readiness centers, armories and facilities, and upgrades to Camp Dodge sewers, which causes Iowa to also lose significant federal matching funds (HF 643). Cutting 20 percent from the Veterans Home Ownership Program (HF 653). Cutting $1 million from National Guard Tuition Assistance, a 24 percent decrease from what the Legislature originally approved and the Governor signed (HF 642).